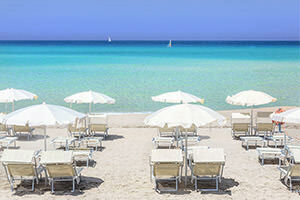 Are you looking for the freedom of an apartment in a residence by the sea or the luxury of a villa in Sardinia? 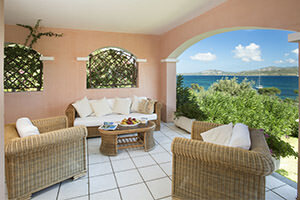 Choose your holiday home in Sardinia with Delphina hotels & resorts! Residences with swimming pool by the sea and prestigious villas at Cannigione, Palau and Isola Rossa. With two elegant residences by the North Sardinia sea, apartments at the Resort Cala di Falco in Cannigione and the Residence Mirto in Palau, Delphina has thought long and hard about holidays for families, couples and young people who want to enjoy the sea in complete carefree autonomy. 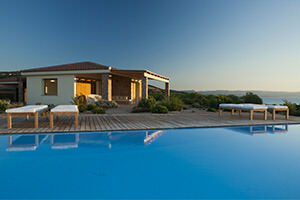 In addition, if you want to give a touch more exclusivity to your holidays in Northern Sardinia, you can choose from the elegant Delphina villas a short distance from the glamorous Costa Smeralda and the villas with pool at Isola Rossa, the perfect formula for a totally relaxing holiday. 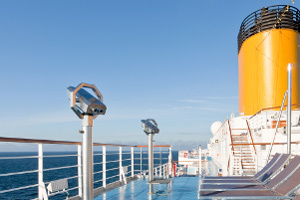 The independence of an exclusive holiday home with all the comforts of the best hotels! Your house by the North Sardinia sea with a privileged position, independence, privacy and freedom ... without sacrificing the services and facilities of a hotel. This is the Delphina residence formula! If you are spending your holidays with family, friends or your partner, the recently refurbished apartments at the Resort Cala di Falco are the perfect base from which to enjoy the sea and discover the most beautiful destinations in the North of Sardinia. A residence with swimming pool, sun-loungers, deckchairs and free Wi-Fi (in the pool area) two hundred metres from the sea. Guests can also enjoy the Resort's tennis and beach volley court as well as free access to the hotel bar and the chance to enjoy dinner in the restaurants and in the lively pizzeria (extra charge made). The apartments, close to the most beautiful beaches in the Costa Smeralda, are just a few metres from the harbour at Cannigione from where you can leave for exciting excursions to the La Maddalena Archipelago. At the foot of the Capo d'Orso promontory and enjoying a unique and charming location on the Cala Capra bay, the Residence Il Mirto is the perfect solution if you are looking for an apartment with swimming pool in Sardinia a few steps from the sea. The private marina next to the beach is a convenient starting point for entertaining boat trips to the islands and Corsica. Guests also have access the restaurants, the wellness centre and the golf course at the 5-star Hotel Capo d'Orso Thalasso & SPA (extra charge made). If instead you prefer the independence of a holiday home in which to have fun with the family or a group of friends, a holiday in a villa is the ideal choice for your stay in Sardinia. The villas at the Resort Cala di Falco are located in the heart of Cannigione, a stone's throw from the Costa Smeralda. Elegant spaces surrounded by lovely little squares and fragrant gardens just 200 metres walk from the beach and close to the centre of this little town on the Gulf of Arzachena. And for the maximum in comfort you can take advantage of the hotel's numerous services such as free Wi-Fi in the reception and bar areas, free (unattended) parking, shuttle-bus to Mannena public beach (not available on Saturday) and free use of sports facilities. (sabato escluso) e libero uso degli impianti sportivi. These villas with swimming pool at Isola Rossa are little jewels that look out over the crystalline sea of the Gulf of Asinara from which you can admire breathtaking sunsets. Some villas have a private pool; alternatively you can relax in the hotel's panoramic swimming pool or on reserved wooden platforms over the sea, equipped with mattresses and beach umbrellas. Even the exclusive Venere Thalasso Centre & SPA and the restaurant with its view of the suggestive Aragonese Tower are open to villa guests who want to enjoy moments of well-being or a romantic dinner by the sea (extra charge made).